SmartPierce™ from Prima Power Laserdyne creates a clean pierce point that is the same diameter as the cut width (right). The area around the pierce point is also clean without the debris typically found at the pierce. 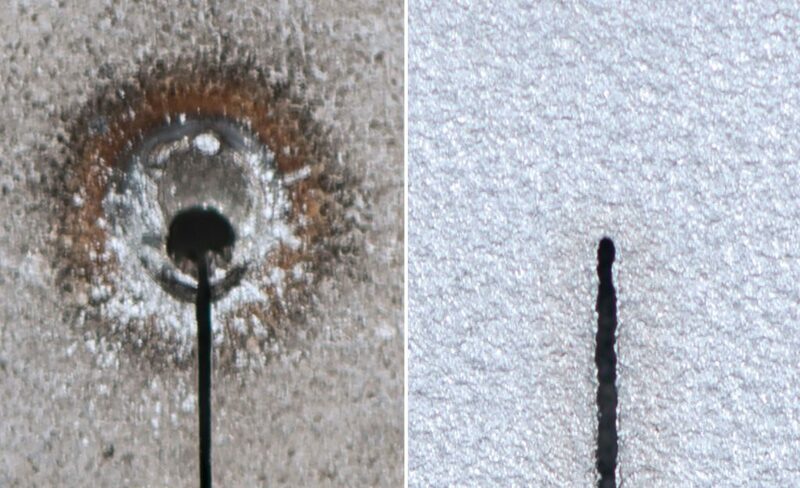 By comparison, standard piercing (left) produces a starting hole that is much larger than the cut width and has significant debris surrounding the start point. Both examples show the result of piercing of 10.5 mm (0.041 inch) thick Haynes® 617 material. SmartPierce™ creates a clean pierce point that is the same diameter as the cut width. It is also smaller than that produced using a conventional piercing process. SmartPierce also effectively eliminates splatter of molten material around the pierce location making for a consistent and smoother appearing entry point. 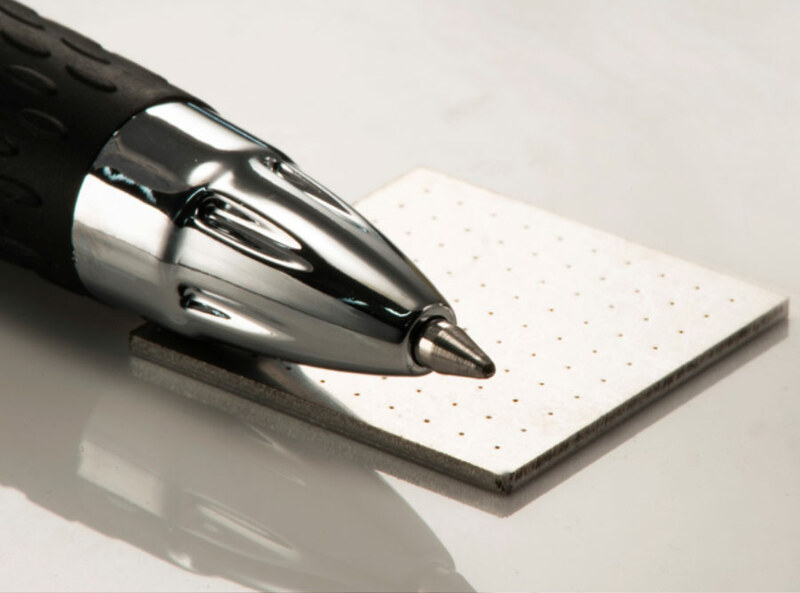 The SmartPierce capability is important in wide range of applications from thin to thick metal cutting. For example, many medical devices, electronics, filtration, and fine mechanics applications require small features in thin materials. Features may be too small to allow for piercing within the “drop-out” or scrap portion of the material. SmartPierce solves this problem. Features such as slots can be produced in a single pass avoiding the time to move around the outside profile of the feature. Not only does this minimize cycle time but it also reduces heat input to the part. In other applications, debris around the cutout area from piercing must be avoided for structural and/or cosmetic requirements. SmartPierce eliminates the need for post process cleaning following laser cutting. Post process cleaning is eliminated with SmartPierce. SmartPierce is made possible by the Laserdyne S94P laser process control. The S94P provides high speed, tightly integrated control of laser, motion, and process sensors. It provides precise, high speed control of the laser on a pulse-by-pulse basis. In fact, through pulse shaping, the S94P enables the power with time to be optimized even within a given laser pulse. SmartPierce is one of many advanced capabilities of Prima Power Laserdyne’s multi-axis fiber laser systems. It is standard feature within the S94P control on the LASERDYNE family of 3 to 7 axes systems which include the LASERDYNE 795, LASERDYNE 430BD, and LASERDYNE 606D fiber laser systems.